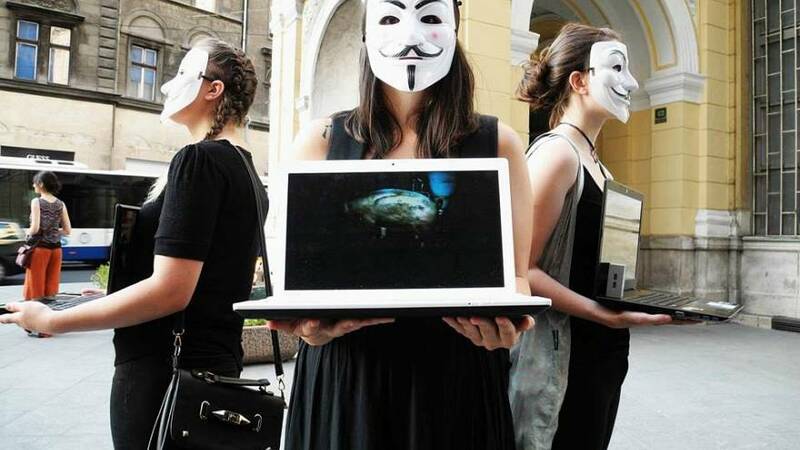 Earlier this month, a group of vegans of Sarajevo took to the streets to expose what they see as the cruelty inherent in meat, dairy and egg production, showing videos of animal suffering to citizens of Bosnia’s capital. At the same time, in neighbouring Croatia, another group was preparing a vigil for animals outside a slaughter house in the town of Sisak, which took place on 15 November. According to the organizers, it was the first such event in Croatia. A growing society of vegans from Bosnia, Croatia, and other parts of the Balkans are fighting a difficult battle to gain recognition for, and protection of, animal rights. Balkan countries are considered to be among the most “vegan unfriendly” parts of Europe. The local cuisine heavily depends on meat and dairy. In some countries, traditional bullfighting festivities are widely popular and it is not uncommon to find the bodies of stray dogs left on the street after having been killed. Throughout the peninsula, hunting is popular both as a hobby and an industry. Robert Međugorac, a 41-year-old Croatian guitar teacher, decided to act on his objections to the killing of wild animals and take on a group of hunters in the field near Zagreb. When he heard shots near his house close to the capital's airport, he rushed out with a friend to face off against the hunting rifles. Međugorac knows what he did was illegal but he cares more about the fact that he saved the lives of at least a few animals. “The following week, a group of activists gathered at the same place to patrol but hunters didn’t show up,” he says. Coming from Croatia's Slavonia region where many households live from animal breeding, Međugorac grew up surrounded by the slaughter of pigs, chickens and rabbits. But he was always sensitive to the suffering of animals. He adopted a vegan lifestyle when he was 24 years old, but became an activist, he says, when he was only seven. He recalls his first “animal liberation action,” when friend’s grandfather got angry with a cat from the neighbourhood which he wanted to strangle. His friend and he convinced the elderly man they would take care of the matter but instead took the animal to the outskirts of town and released it. “You can imagine everyone’s surprise when the cat returned from the dead to reappear in our neighbourhood three days later,” Međugorac told Euronews. Nowadays, Međugorac's activism is more organised. He runs the Oslobođenje životinja (Animal Liberation) web site to raise awareness about animal rights. The number of visitors to the site has been slowly increasing with tens of thousands of people now reading the articles he posts. Robert also organises public debates on animal liberation-related topics where participants confront opinions and sometimes get into heated discussions about the ethical treatment of animals. Even though far behind its Croatian counterpart both in number of activists and events, the Bosnian vegan community has taken heart from what is happening across the border. Bosnian vegans, most of whom live in the capital, Sarajevo, organise increasingly frequent street actions and protests and use social media, such as Facebook, to promote a "cruelty-free" life style. Maida Šabeta, a lawyer and PETA campaigner from Sarajevo, says being a vegan activist in Bosnia was much more difficult a few years back when she was the only one willing to make her voice heard. As one of Bosnia’s loudest opponents of farming animals for fur, she is disappointed that a ban on the industry was recently pushed back another ten years (until 2028). But she is not discouraged. “We often hear that our governments are corrupt and that there is no way to negotiate animal rights with such people. But it’s the same everywhere in the world,” she says. To the south-east of Bosnia, Kosovo has very few vegans and the concept is still very unfamiliar to the majority of the population. “I have to explain to everyone why exactly I am who I am - ninety percent of people do not even understand me and think I must be crazy or something like that,” 26-year-old Kosovo vegan Elza Ramadani told Euronews. That is why she chooses to promote her lifestyle by example. Vegans in Kosovo haven't yet organised into associations or undertaken public activities. A small group are in touch on Facebook groups and occasionally organise dinners and hangouts. In Ramadani’s opinion, Kosovo as a society lacks the civic force to protest for social causes and vegan street outreach would not make much sense. “With so few vegans, what kind of street action could we possibly do?” she asks.